CHICAGO — Toyota revealed new sport packages for its Tundra pickup and Sequoia full-size sport-utility vehicle on Thursday at the Chicago Auto Show along with an adventure package for its popular RAV4 SUV. 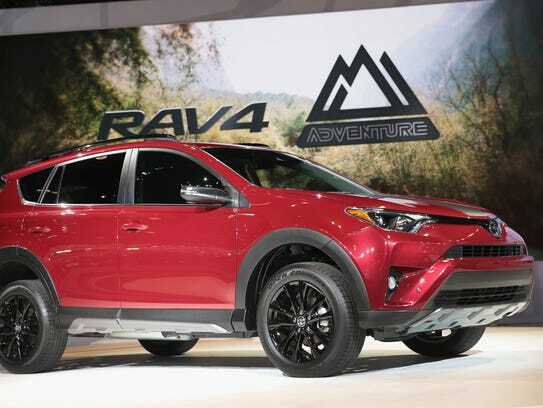 The active lifestyle-inspired RAV4 Adventure will be available in front-wheel drive and all-wheel-drive. Both versions feature a standard towing package that includes an upgraded radiator and supplemental engine oil and transmission fluid coolers, as well as a suspension system with a higher ride height. Now, if Toyota would simply stuff the 3.5L V6 under the hood . . . Cool - not impressed but I like it. Manufacturers are under more gas mileage pressure we may never see bigger engines in anything any more. The RAV4 four cylinder does seem like it is rock solid though and will last a long time. Hmmm... Maybe too cool for me: Ugly. But I wonder if the towing package upgrades reflect known issues with towing by a stock RAV4 or do they enhance the towing capability of the RAV4 Adventure? There are more details in this discussion.